Two poplars but where? Horace Sykes does not tell us. 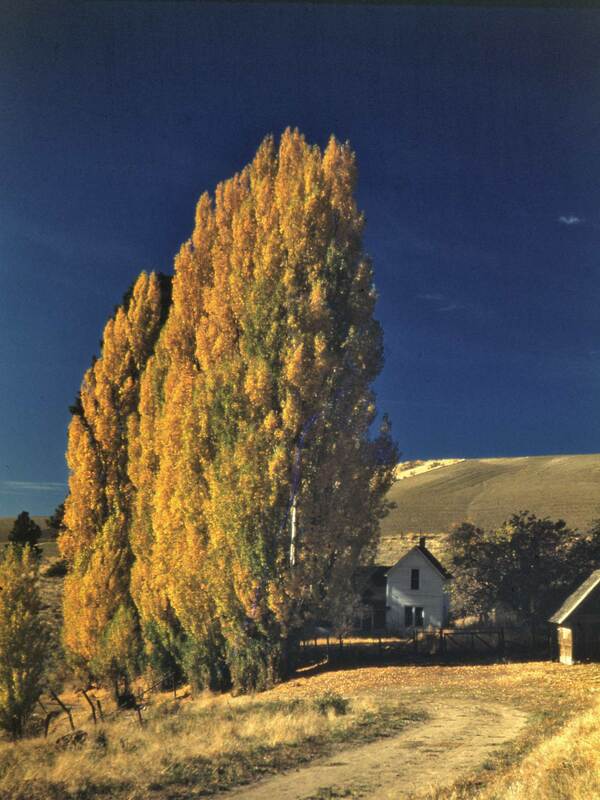 To me one looks Okanogan and the other Palouse, or vice versa. Are they poplars? My best evidence is based only on “family resemblance.” Anyone in our family would have called these stately trees poplars. A Horace Sykes poplar somewhere. A Sykes poplar somewhere else. Hey guys, these are reverse angles of the same trees. look at the fenceposts on the downhill side of the road and the partially obscured pine or evergreen behind the main grouping, and at the bend in the rood. Mike, I agree. That was my first thought, too, based simply on the impression of the sky, the color of the trees, the grass, the textures. But the details you point to clinch it. The second photo is simply taken from higher up and the angle is rotated to the left. Yes, I believe these are Lombary poplars. 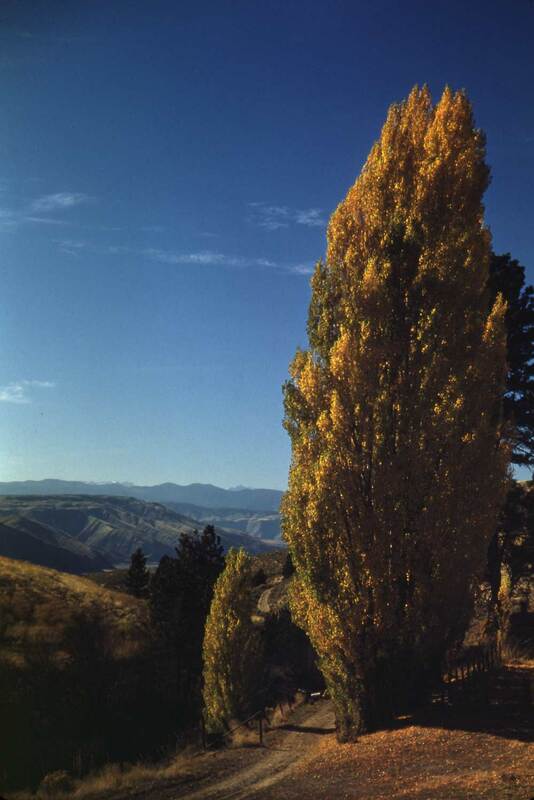 Populus nigra ‘Italica’. For a moment before posting these I thought about that possibility, but it was late and I was weary and so brushed it aside. I didn’t really study the details as you did Mike. I floated along, riding the picturesque dreaminess of it all. But perhaps in the caption there exists a half-conscious intimation of your distinctions. Do I “hint” in that direction with my vice-versa “flip-flop.” Not so much “reverse” angles but 40 degree difference – the difference between the “somewhere” and the “somewhere else.” So Sykes took one shot for tree and farmhouse and then walked a few yards in the direction of the farm house to take the other for tree and winding road plus mountain horizon. But where would you speculate all this is grouped? 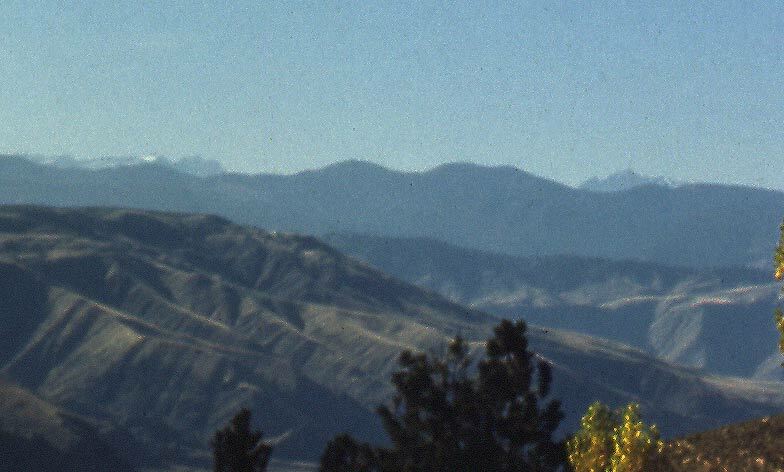 There are mountains on either side of the Snake River’s Hell’s Canyon that resemble these on the horizon and, of course, there are many more such in the Cascades. well, the localization is beyond me, surely. but those mountains beyond the foothills might be useful diagnostics. Baker and Adams, maybe? I’ll hunt for that SKYKES and make a detail of those distant mountains for you to explore. I’ll post that detail directly below the poplars blog insertion.